The Texas Legislature Finally Releases New Proposed Congressional Districts – Tell us What You Think! Texas Legislators waited till after the Regular Session to release the new proposed Texas Congressional Map. Now we finally get to see it. Governor Rick Perry will have to put it on the Special Session Agenda it is going to be voted on by the Texas Legislature. My city of Lumberton, in East Texas, gets split in two by our old District, with Kevin Brady, and a new District. The new district looks strange (they always do because of differences in population) but it leans Republican so I can’t complain about that. Besides my displeasure with Republicans splitting the new districts with Democrats, and my pleasure with getting a new Republican District in East Texas, I do not have an overall opinion of the map yet until I hear more info about it. What do ya’ll think? Is it good for you? Is it bad for you? The TSA agents cornered them and bombarded them with repeated questions like, “what are you hiding in your face.” The agents did not give the wounded warriors time to explain anything and went straight into accusing them of “hiding” something in their bodies. Yeah, they are hiding something alright. They have metal in their bodies from war! My friend told me that one TSA agent came up to him and asked what he was hiding in his leg, but before my friend could answer he said that the TSA agent grabbed him, without notice, right in the crotch area as if trying to find something hidden. My friend has served many tours of duty and I believe him when he tells me that it took everything in him not to react defensively when this agent grabbed his crotch without even letting him know he was going to be pat searched. This political correctness is sickening. Now don’t get me wrong, I am not saying all Muslims are terrorists or are bad people. I am saying that if you know the guy who just robbed a bank is a short white guy then you make sure you search all short white guys. Sure, you don’t overlook the other people around the bank because the money might have been passed off to someone who is not short and white, but since you can’t possibly check everyone then you at least make sure you checked all the short white guys! That is not discriminating, that is just common sense and it is even common practice. In WWII there were camps right here in Texas where all the Japanese were put into. Why? We were at war with the Japanese. Were all the Japanese in camps bad people? No. But since it was the Japanese we were at war with, and it is not possible to know which ones were good or bad, we just locked them all up till the war was over. That was an extreme example. I am NOT saying we lock Muslims up or harass them. I am simply saying how in the world can you search a wounded warrior but not search a Muslim even though the Taliban is a Muslim group? If the Taliban was a group of wounded warriors then I would understand wanting to pay special attention to the wounded warriors. But that is not the case. Some Texas Senators backed down and now the bill is stalled. I think our Texas Senators need to stand for the people of Texas and stand up against this molestation. You think Obama wants to be the President who stopped all travel and financially crippled the airlines? No. If Texas stands its ground and passes the bill then you can bet that the Federal Government will have to figure out a less invasive way to keep flights safe. UPDATE: For the record, I would be against any national regulations. This is a state level law. I would also be against any requirements to specifically target people who are bullied based on their sexual preference. I believe bullying is bullying and it should not be tolerated no matter what the reason for the bullying. Special treatment of gay bullying (which is only a percentage of all bullying) would open the door to promoting a homosexual agenda. Bullying should be dealt with and not just one type of bullying. There should also be special provisions to allow people to genuinely speak their beliefs against homosexuality. No homosexual deserves to get beat up, but there students should also be able to believe and civilly express their beliefs against that chosen lifestyle. Michigan passed an anti-bullying law recently with a great provision that protects religious beliefs. That section of the Michigan Law reads: (8) This section does not abridge the rights under the First Amendment of the constitution of the United States or under article I of the state constitution of 1963 of a school employee, school volunteer, pupil, or a pupil's parent or guardian. This section does not prohibit a statement of a sincerely held religious belief or moral conviction of a school employee, school volunteer, pupil, or a pupil's parent or guardian. The Texas Senate passed a bill that will require School Boards to develop specific methods for reporting and investigating bullying, including allowing school boards to transfer bullies to another classroom or campus. No longer will a teacher at Seagoville High School in Dallas, TX be able to watch a kid get beat up by a bully and not even report the bully. With this new law, these schools will have to document and investigate every potential instance of bullying. Now parents will be informed about what is going on at school. Now schools can transfer bullies away from the kids they are bullying. No more excuses, no more ineffective and politically correct policies that do nothing to prevent bullying. Now schools will actually have to start DOING something about bullying. A Lumberton High School Principal Mr. Bilberry (the same one who said bullying was “kids having fun”) did a play last year that was completely inappropriate. It contained many vulgarities and sexually explicit jokes that had nothing to do with bullying. Even the principal in the play used vulgar language, as if that has to do with bullying. Mr. Bilberry defended the play because it had an “anti-bullying” theme. First of all, the anti-bullying theme was buried in the vulgar language and talking about putting an online ad up to get laid. Second of all, the play does not do anything to actually investigate, report and prevent bullying. Schools don’t need an inappropriate play to do something about bullying, especially since the play was completely ineffective. Schools need real policy to stop bullying. Not even a couple of days after the play a kid got beat up at the school and, over the last few month, students say bullying in Lumberton ISD has not gone down at all. This law will force all Texas schools to start doing something real to PREVENT and INVESTIGATE bullying. No more talking the talk. It is time to walk the walk. I am happy to say that your calls and emails worked! Thanks for all of your hard work in teaming together and helping stop these bills. I talked to Mike Hamilton this week and he told me that he killed all the gambling bills in his licensing committee! Thank you Mike Hamilton for listening to the majority in your district who do not want expanded gambling in Texas! 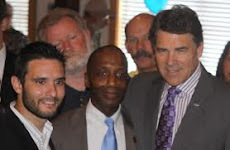 Like Rick Perry told me, if it was so great then Nevada would be doing great financially, but they aren’t! I believe there are some other gambling related bills still in play that were not in Mike Hamilton's committee so keep up the good work everyone! Just yesterday I posted this article about a Seagoville High School teacher watching a kid get beat up right in front of him and not even calling for help. I also pointed out problems with school policy that allows for kids to get beat up without being able to defend themselves. A SECOND video has just surfaced which shows a different fight a couple of weeks ago and the same teacher just stands there and watched the fight and does not even say anything! Thank you Teacher’s Union for wanting to keep this teacher in Texas Schools so he can allow kids to get beat up and fight each other. This teacher finally got suspended while the school is reviewing these videos. The problem is that if these videos did not get posted online, and if there was not a public uproar about these videos, then I have a bad feeling that the administration would have never done anything about this teacher. Lumberton Middle School Fight Last Week. Teachers Do Nothing and Parents have to Call Front Office to Tell School About Fight. After posting this fight video yesterday, I got a call from a concerned parent right here in my hometown of Lumberton, TX. This parent said that, while she was waiting in line to pick up her child at Lumberton Middle School, she witnessed a huge fist fight break out with several students involved. She said she was waiting for a teacher to come break it up but that never happened. The parent said there were teachers out there and they had to have heard the fight because all the kids were yelling and chanting fight and the fight was enormous and involved several students. After it was clear that no teachers were stepping in, this parent called the front office of Lumberton Middle School and told them about the fight and asked them to break up the fight. First, I am not accusing any Lumberton Teacher of standing and watching this fight like the teacher at Seagoville High School. I would hope they just were not out there to see it. BUT… even if they school did not break up the fight because they did not see it, we now have the issue of WHY DID NO ONE SEE IT. Why were there no teachers supervising the students outside getting picked up after school? How does that make you feel knowing the level of supervision your children are getting when a huge fight like this can go unnoticed until a parent calls the fight in to the front office. We need to get back to the basics of protecting the children in school and we also need to focus on good teachers. We need to stop all this political correctness of punishing a victim if that victim fights back after getting attacked and we need to stop the unions from making it hard to fire bad teachers like at Seagoville High School in Dallas, Texas. Fights happen at schools, right? Well this fight is different than your normal school fight story. A Seagoville High School Student (Dallas, TX) gets attacked at school and the teacher just stands there and watches the whole thing. The teacher did nothing! Even if you buy the argument that the teacher did not want to get hurt, the teacher still did not even yell stop or call for help. This teacher even seems to enjoy the attack and just stands there watching until the boy who was attacked walks out of the room. This teacher is a disgrace. Even the granny in this video has the guts to step in to try to break up an assault at McDonalds. It is interesting to note that the guy flipping burgers at this McDonalds was fired for watching and enjoying the fight instead of, I don’t know, calling the police! It is good to know we have a much lower standard of school employees trying to keep students safe in Texas Schools (sarcasm). The guy flipping burgers gets fired but the teacher gets a pat on the back. The teacher’s union backs this teacher 100% because, well, that is what unions do. Most of a union sales pitch is centered on the idea that the union will represent you and protect you from the big bad supervisors who want to punish you when you do something wrong. This California teacher’s union is even supporting convicted cop killers for crying out loud! And I will be coming out with a story soon about a killer here in Texas who wants to be a police officer and, you guessed it, the union is backing this killer to get a badge. A big problem in most Texas Schools is that school policy enables bullying, fights and violence. Yep, you heard me right. So how do they enable bullying? It is simple. Many Texas Schools have a policy that automatically and evenly disciplines both students involved in any fight (or assault). This enables bullying and victimizes the victim because the victims of assaults are not allowed to fight back, and if they do try to defend themselves they get the same punishment as the bully who attacked them. This allows for bullies to roam schools and attack students with little or no resistance because the good students do not want to fight back for fear of getting disciplined. But wait, you might say they don’t have to fight back because the teachers are there to protect them from fighting and discipline the student who attacks other students. WRONG! Apparently in Dallas the unions are telling the teachers to just stand by watching and do not even bother calling someone to come stop the fight or discipline the bad guy. The Dallas school system says they are “investigating” but I don’t know what there is to investigate because you have the darn video. I am not just making this stuff up about schools in Texas enabling bullying. I write this based on personal knowledge of kids in my own hometown of Lumberton, TX who got assaulted at school and the principal tried to give the person who was attacked a suspension for trying to defend himself in the attack. And don’t bother reporting bullying to the High School Principal here at Lumberton ISD, Mr. Lynn Bilberry, because this principal told me once, when I reported bullying of a student, that there is no bullying at his school and when kids harass and make fun of other kids it is not bullying and instead it is just “kids having fun”. Principal Bilberry even tried to get a student arrested for attempting to record the verbal assaults of the other students so that there was proof of the bullying to show the principal who does not believe there is bullying at his school. What is just as bad is that the City of Lumberton has kept all of this secret and the city has not told the residents of Lumberton anything. They have hidden using eminent domain, and also they have hidden this million dollar judgment against the city. The first that the people of Lumberton will hear of this is when this article gets posted online and sent to the media. The City of Lumberton wanted some property to build a detention pond to hold water when it rains. Mr. Hooks doesn't want to sell and he does not agree to sell the land. The City of Lumberton has a condemnation proceeding (eminent domain proceeding) to take the land. When the City of Lumberton took the land they told Mr. Hooks that he was only getting roughly $2,000 per acre for the land (about $200,000). In comparison, the city had just bought over 84 acres of land a couple of years ago to build a park. This park land is right by the property owned by Mr. Hooks and they paid well over $2000 an acre for the park property and yet they only offered just under $2000 per acre for the property they were taking from Mr. Hooks (click here to see article about the land purchased by the City of Lumberton to build a park) http://setxhomepage.com/search-fulltext?nxd_id=49542 In fact, the Lumberton City Council, on Feb 14th, 2011, voted to buy an additional 70 acres of land for the park right by the property owned by Mr. Hooks and they paid well over $2000 per acre for the 70 acres. So back to the Story, The city only offered just under $2000 per acre for the land they were taking from Mr. Hooks. Mr. Hooks said no to that price and a commission was appointed to determine a price to give Mr. Hooks. The Commission said that the City of Lumberton should give Mr. Hooks about another $100,000 (about $300,000 total at about $2900 per acre). Mr. Hooks said no to that price too and he gets a lawyer. The City had only set aside about $300,000 to pay Mr. Hooks for this property. By subtracting the $299,416 that the city already set aside from the over 1 million dollar judgment, the City of Lumberton has to come up with a cash sum of $886,034.02 to give Mr. Hooks. As you can see, the City of Lumberton Budget for the entire year is only about 3 Million Dollars! This means the Eminent Domain Judgment against Lumberton is over 1/3 of the entire year's budget. The good old boy system in Hardin County thought they could still do what they want whenever they want. They did not realize that times are changing and people are waking up and fighting back. The City of Lumberton used eminent domain in 2006 to get a section of land from a disabled citizen (Mr Rich in Boykin Subdivision) so that they could build a cut through road from that subdivision to another subdivision that was going to be built. You see, the city never planned for future growth. They took that land with ease even though there was a petition drive against using eminent domain and an uproar from the citizens of Lumberton against taking this man's land because there were other, better places to put a cut through road. The city took land before and they were so confident that they would have no problems taking the land from Mr. Hooks, they already built the detention pond even before they concluded the eminent domain proceeding! The proceeding was spearheaded by Lumberton's Attorney Kenneth Furlow. I recently uncovered that Kenneth Furlow, a public servant for the City of Lumberton, has not not paying his county property taxes for over a decade and owes over $40,000 http://hardincountyconservatives.blogspot.com/2011/04/update-to-lumberton-isd-fishy-attorney.html. At the same time he has owed this money in back taxes, he was getting the Lumberton School District to postpone payments to him for over 4 years http://texasgopvote.com/reclaim-education/more-shocking-texas-school-financial-corruption-stories-002610, possibly so that his income would not show and so that he could evade having to pay his debts. Only after exposing the City Attorney problems did the City Council of Lumberton finally fire him. And my sources tell me that the Mayor of Lumberton opposed firing the city attorney even after all the City Attorney has done wrong! Why? Because they are old friends in this good old boy political system. What is even worse is that NO ONE in the city of Lumberton knows about this judgment against Lumberton (ultimately it is a judgment against the people of Lumberton). In fact, no one even knows that the city used eminent domain to take this man's land. The media does not even have any idea. How can a city just hide this kind of thing from its residents? It makes you wonder what else they are hiding from the people who they represent. Texas has an Open Meetings act https://www.oag.state.tx.us/AG_Publications/pdfs/openmeeting_hb.pdf that requires government agencies to be open about what is going on by way of public meetings and notices. Unfortunately, much of what happens in east Texas government happens illegally behind closed doors in violation of the Open Meetings Act. It is interesting to note that a man has just filed a lawsuit against the Lumberton School District for violating the Texas Open Meetings Act. The suit alleges that LISD has not been open about what is happening at meetings by writing up vague meeting agendas and notices and also for making decision behind closed doors before the meetings even begin. http://www.beaumontenterprise.com/default/article/Suit-alleges-district-violated-Open-Meetings-Act-1347847.php I do not have a dog in that fight so I will not speculate as to whether or not the allegations against LISD are true. I will say that it would seem that the City of Lumberton should be the one sued for violating the Open Meetings act! I have the minutes from City Council meetings over the last couple of years and I never read in any of the meetings where the there was mention of a lawsuit against Lumberton. I never even read anywhere in the meeting minutes where they city was using eminent domain. The city might be able to go into executive session to deliberate these issues, but they still have to tell the people what issue they are deliberating and what the final outcome of the closed meeting is! For example, the minutes from the Lumberton City Council's December 13th, 2010 meeting states that the city council went into executive session at 7:30pm and came out of executive session at 8:31pm. That is all it says. It does not say why they went into executive session nor does is list the government code they were using to go into executive session. Bin Laden Found on Tips from Guantanamo Bay. Didn’t Obama What to Shut that Place Down and Release the Terrorists? Some have asked me if I am trying to politicize the death of Osama Bin Laden. I say no. I just want to give credit where credit is due. The death of Bin Laden is an amazing day in the history of America and I am very happy, just as everyone else is. But the full credit needs to go to our brave men and women who have fought and died over the last decade. THANK YOU SOLDIERS AND INTEL PERSONNEL. These brave men and women laid the groundwork which led to these tips which eventually led to finding Bin Laden. The credit needs to also go to President George W. Bush. It was his policies (which Obama greatly criticized) that led us to Bin Laden. Obama’s speech after Bin Laden’s death was all about how Obama caught Bin Laden. Yes, Bin Laden was caught under Obama’s watch. President Obama deserves some credit of course and I thank Obama for making the call to go into Pakistan to kill Bin Laden, but Bin Laden was not found because of Obama and instead, Bin Laden was found IN SPITE of him. Numerous news stories have come out which show that we found Bin Laden based off of tips from Guantanamo Bay and other terrorist detention centers. Wait a second! Didn’t Obama say that Bush was a really bad guy for having those detention centers and we should bring these terrorists to America to be given American rights and even release some of them? Yep, he sure did. Thank God Guantanamo Bay was not shut down because if not for tips from the terrorists at Guantanamo Bay, we might never have found Bin Laden. Do you think those terrorists would have been talking if we gave them a lawyer and put them in a cozy American Prison with TVs and guitars? NO! President Bush kept America safe since 9/11 and his policies helped us finally get Osama Bin Laden. In fact, the original tips that led to Bin Laden started coming in under Bush and long before Obama was President! So thank you President Obama for following through because you could have decided not to. Thank you. But we can thank Bush and the years of Dedication from our Military Service members as the reason for the groundwork and tips that led to this great time in our history when Osama Bin Laden was brought to Justice. So we killed the most wanted terrorist. We killed the Islamic terrorist who was behind the 9/11 attacks. They are going to bring his body back to America as proof right? What, they buried him already!? According to news reports Bin Laden has already been buried at sea, and get this, President Obama wanted to make sure that he was buried in accordance with Islamic practice. Are you kidding me! This is the number one enemy of the United States of America. The innocent lives lost on 9/11 did not get proper burials, and yet our President wanted to make sure that the worst terrorist in the world got a proper Islamic burial. This is insane! The reason he did it was to appease the Muslim Terrorists. I suppose he thinks that if the United States gives Bin Laden a proper burial then the terrorists will not want to attack us in retaliation. This is just the beginning. We have already started to bow to terrorists. When Americans have wanted to rally against the Koran we have the United States telling them not to because it might make the terrorists mad. Then, just a couple of weeks ago, one man was actually legally prohibited from having a rally against a mosque because it might make the terrorist mad. That is right, Americans are already having to have our rights taken away to appease Muslim Terrorists. There is no doubt in my mind that Obama is a Muslim. His father was and so is he. Obama took time to give a proclamation for earth day and proclamations for other Muslim Holidays, but refused to give a proclamation on Easter, the most important Christian holiday celebrating the resurrection of Jesus Christ. This is the happiest day, and the saddest day…. This is one of the most important and happiest days in my life! Even if Bin Laden had already been rendered ineffective, thanks to the measures that President George W. Bush had implemented that kept us safe over the last decade, it is still a monumental symbolic victory to have killed the mastermind behind the attacks on September 11, 2001 that killed thousands of Americans and it finally brings Bin Laden to Justice. President Obama says this attack on Bin Laden had been in the works for several months since getting a tip about where Osama Bin Laden might be hiding in Pakistan. Yet, it was not even a month ago that President Obama was willing to shut down the government and not pay the military because he wanted to make sure that an abortion provider, Planned Parenthood, was paid before the troops can get paid. Obama was willing to not pay the men and women who just killed Osama Bin Laden, and he was willing to do this even though he knew they might be close to finding and killing Osama Bin Laden. Obama opposed the successful troop surge in Iraq and he took 3 months to decide if he should send more troops into Afghanistan after a troop surge was requested there. Obama admits in his speech that years of groundwork had been laid by intelligence gathering and fighting terrorists in Iraq, Pakistan and Afghanistan. This victory of killing Bin Laden is a product of the dedicated men and women who served America over this past decade. It was not any special action carried out by President Obama that led to the tip of where Bin Laden was hiding. On the contrary, it was a tip that came about because of the years of work and dedication of our American Military, and it started well before Obama was President. In fact, Obama was willing to not pay our US Military members not even 3 weeks ago even though he knew they were on the verge of getting to Bin Laden. Obama will get the credit for the killing of Bin Laden under his Presidency and he will make it a campaign slogan for sure. I say it happened in spite of him, and I believe many other Americans will see through the President’s attempts to take credit for being the reason Bin Laden was killed. Just like President Clinton took credit for the economic upturn due to the dot com boom (which had nothing to do with him), President Obama will take credit for killing Bin Laden and the US military who worked for a decade to find and kill Bin Laden will be downplayed in order to promote Obama as the reason that Bin Laden was killed.